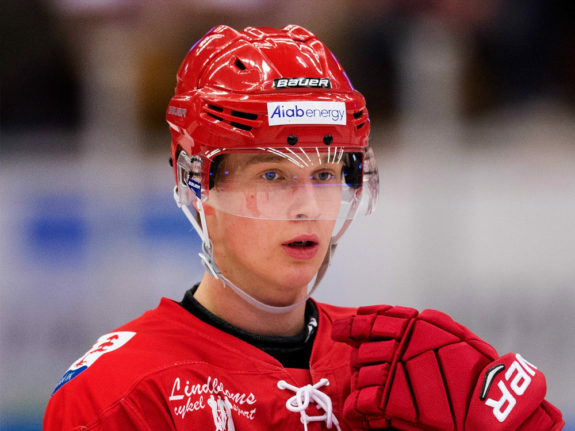 With the Fifth Pick in the 2017 NHL Entry Draft the Vancouver Canucks Have Selected Elias Pettersson From the Timrå IK in the SHL. 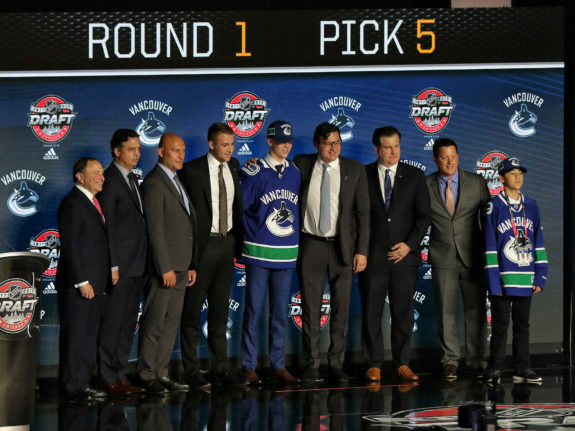 The Vancouver Canucks decided to add to their Swedish depth with the fifth overall selection in the 2017 NHL Draft – taking Elias Pettersson. The young forward met with the team on a number of occasions even sitting down to dinner with the current Swedish leaders of the franchise – the Sedins. At just 18, Pettersson was listed all over the board when it came to final rankings, but ultimately impressed the Canucks. In 43 games with Timrå IK last season, Pettersson tallied 19 goals and 41 points averaging nearly a point per game. He added six points in just three SHL qualification games showing just how skilled he is offensively. As you can see, Elias Pettersson has experts divided in their assessment. But they all agree on one thing; he is a pure talent. Arguably, few of his peers can compare to his talent – but how much work and patience will Pettersson demand in order to succeed? The 2016-17 season was a breakthrough year. Playing for Timrå IK in Sweden’s second-best league, Hockeyallsvenskan, the 18-year-old dangled his way into the spotlight. While producing at almost a point per game clip during the regular season, Pettersson showcased a good attitude and spectacular class that would be welcome on any team. That’s why you often find him on the highlights reel. It’s not without cause that Pettersson has been compared by some to Henrik Zetterberg, being a Timrå product himself, and Pavel Datsyuk. If that doesn’t tell you what level of hockey IQ and puck control we are talking about here, I don’t know what does. Drafting Pettersson adds some depth down the middle for the Canucks. On top of that, he has two very talented Swedes within the organization that can help develop him into an NHL calibre player. While he likely won’t see any NHL time next season, the Canucks may have found their next wave of center talent. With the Canucks prospect pool as depleted as it is, drafting Pettersson might just throw him right into their top five. That still doesn’t mean anything concrete regarding a timeline as to when he could make the jump to North America and the NHL, but it does say something about just how talented this kid is.